Here we demonstrate a strategy of obtaining tin oxide (SnO2) nanoparticles, via a typical hard templating impregnation (nanocasting) process starting from different mesoporous silica hosts. X-Ray powder diffraction, both scanning and transmission electron microscopy and N2 physisorption at 77 K techniques are employed for the structural-morphological characterization of the synthesized materials. Cyclic voltammetry and galvanostatic discharge/charge cycling tests are used to assess the electrochemical behaviour in lithium test cells. 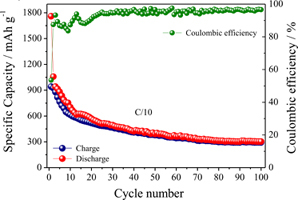 The results obtained demonstrate that SnO2 particles can readily undergo reversible reaction with lithium ions at ambient temperature, showing good specific capacity and excellent charge-discharge efficiency.